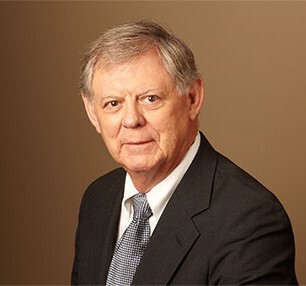 Since graduating from law school in 1969 and clerking for the Fifth Circuit and the Supreme Court of the United States, Jim George has been representing clients in litigation and related matters. He has represented a wide variety of clients in trial and appellate courts throughout the United States. Jim has been included in The Best Lawyers in America© for Bet the Commercial Litigation, Commercial Litigation and First Amendment Law since 1987. He has successfully argued two cases before the U.S. Supreme Court and multiple cases before the Supreme Court of Texas. Jim has successfully tried jury cases in both rural counties and all of the major cities in Texas, as well as in Louisiana and Michigan. He has successfully prosecuted and defended class action cases. Jim has represented plaintiffs and defendants in patent, securities, media, contract, and tax cases. He has represented National Western Life Insurance Company, individual investors in securities cases, CBS, NBC, Time Warner, The Wall Street Journal, Warburg Pincus Equity, LP, the City of San Antonio, and many international corporations, as well as individuals and small business owners.